It's hard to describe how I felt after reading this social-media post from my longtime friend James Lucas. I didn't cry, but I could have. My emotional response caught me off-guard, but made a lot of sense when I thought about it. I'd first met James fifteen years ago when we both worked in Yosemite. During those hot, dusty summers we dreamed big, talked big and flailed hard. In those days, James was a relative beginner, but he was the leader of our ragtag crew. I remember looking up to him, but always wondering if that was smart. In other words, he was inspiring, but human. Like James, I had a tendency for bloody fingers, shaking legs and desperate lunges to glassy hand jams. One time, we sputtered up Half Dome's Regular Northwest Face in twice the time we had projected. We abandoned the Death Slabs descent and stumbled down the tourist trail as a forest fire raged around us. The embers from our experience sparked more wild adventures. After a couple of years in the ditch slaving away for "the man," we decided that working was a distraction from climbing. Now, we're older, and maybe wiser. Work is necessary to afford plane tickets and eat healthy. In those days, the best way to improve was to climb every day, even if that meant sleeping in the dirt and eating whatever we found in a dumpster. To kill the rainy months up north, we set up shop in J-Tree during the winters. We picked up free soloing and embraced the ritual with an innocent vengeance. It was all-good until late in 2004, when James slipped off the top of Intersection Rock and broke himself to pieces. He spent the next eighty-one days in the hospital, endured eight surgeries and could barely walk for most of the next year. Precisely 381 days after his fall, we climbed the route he whipped off. Of course, we roped up that time, but James soon came back to climb it cordless. He wasted no time in killing demons, and soon he was climbing better than ever. I can't fathom how he did it. In 2010 he made a free ascent of the Leaning Tower's West Face and then homed in on the monstrous wall across the valley. 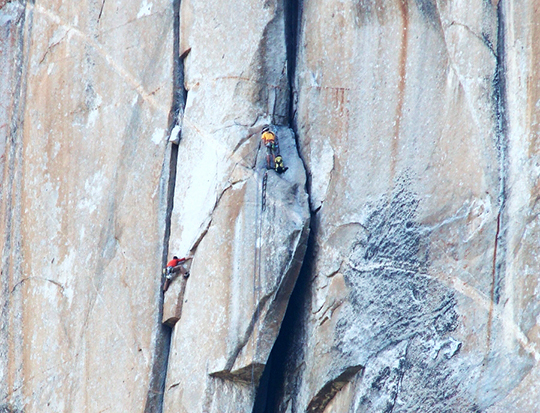 Free climbing El Capitan became his vision. 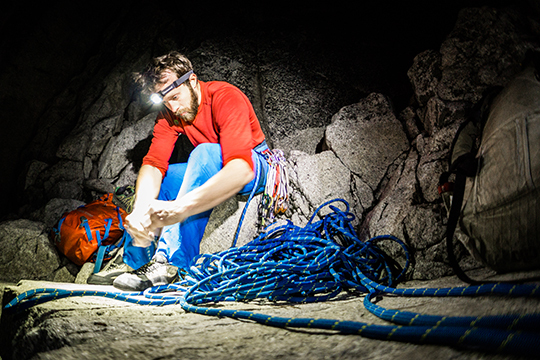 Even though James and I continued to dedicate our time to climbing, something had changed. A rawness settled in. The gritty nature of our sport started to wear on us. We have both decided the pain is worth the pleasure. But still, being a climber hurts sometimes. 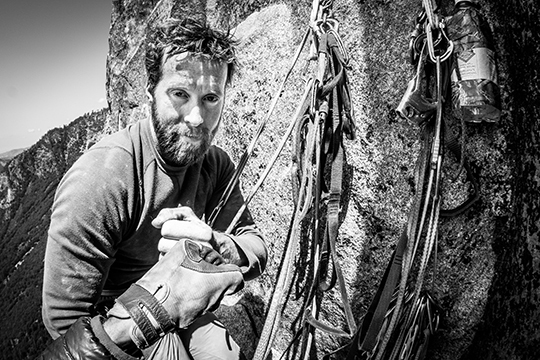 In recent years, we've talked about how climbing takes a toll on our ability to lead a more balanced existence. I quested in vain for self-worth on snow-laced peaks, and James left the Valley year after year feeling the sting of failure. For three seasons, he progressed on Freerider, but as each autumn shifted to winter, he left empty-handed. Finally, on May 6, 2015, James spent 14 hours and 55 minutes sticking to the slick granite and realizing his goal. The meaningful achievements that stick with you for a lifetime may become less frequent, but they do still happen. They remind us of why we love to climb and of why we love to live. Some victories come with so little effort that they fade as soon as you clip the chains. Other battles are won with great sacrifice; the depth of those successes measures to the bottom of our ocean. The journey begins in the cold blackness and ascends toward the light. At certain points, it's hard to decipher up from down. It often feels like you're adrift in meaningless space. At some point, with a will to breathe, the surface is broken. You gasp for sweet air. All the hard work and commitment pay off. You bury the past, embrace the present moment and look forward to the future. Do we climb because we don't know what else to do? Are we chained to the life we have chosen? I don't ask those questions anymore because I know the slog is worth the summit. I finally realize that like James, we can shatter, reassemble the pieces and follow our passion again. As I write this, James has finished his mini post-send vacation in the Bay Area. He's coaxing his van back toward Yosemite. I don't know his plan, but I'm pretty sure it involves finding the next challenge.